In 2017 we donated 10% of Homeless Dating's revenue to our favourite homeless charities. We believe every penny counts to help get a homeless person off the streets, and our members make it happen to give a little back to those in need. You can make a difference too, if you are single not only can you find true love but you can also help the homeless. The people on this site are not homeless - far from it - they all have homes, but they also have compassion, and would like to support people less fortunate than themselves. Everyone on this site is a genuine single looking to find a new partner. However, everyone who signs up on this site knows that they are helping the homeless - as for every full member a contribution is made to help four homeless charities in their work. In Western countries the large majority of homeless people are men - over 90%, the majority of which are single males. Being single and homeless clearly isn't much fun, which is the point of this site. People who are homeless are often unable to acquire and maintain safe and adequate housing, and often lack a fixed, regular, and adequate night time place to stay. The definition of homeless does vary from country to country, and the term homeless may also include people whose primary night time residence is in a homeless shelter, a domestic shelter or another ad hoc housing situation. 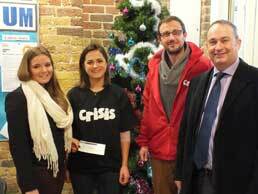 We support three homeless charities to help them in the great work that they do helping the homeless. CentrePoint UK, Shelter and St Mungos directly benefit, albeit in a small way, from members who join this site. The inspiration behind this site is a local homeless guy called Vinny who dreamt up the idea to create a Homeless Dating site. Thanks to everyone for their messages of support, if you want to help the homeless you can donate via one of the well known homeless charities. Your donation could help give a homeless person a bed, shower and food for the evening.